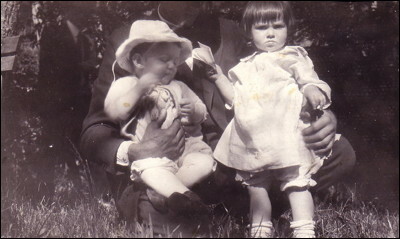 Lowell Osborn (left) and my mother Fredene Daugherty (right) in Lithia Park, Ashland, Oregon, 1922. I don't know who the two men are. This may have been the same year my grandfather, Frederick Armstrong Daughtery, planted sycamore trees in the park, though I have also heard they were planted as early as 1914. He had grown them in his nursery. Those trees are still standing in Lithia Park in rows above the bandshell, next to the Japanese Garden.